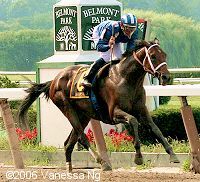 Belmont Park in New York has a full slate of stakes events spread out over Independence Day weekend, with two Grade 1 events to kick off the festivities Saturday where a crowd of 14,829 was on hand. 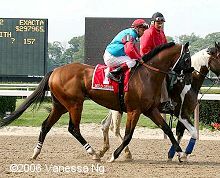 Some of the best older horses on the east coast entered the $400,000 Suburban Handicap (G1), a 1 1/4 mile trip on the main track. Pimlico Special winner Invasor was sent off as the 5-4 favorite in the field of seven, with last year's Queen's Plate winner Wild Desert the 7-2 second choice. 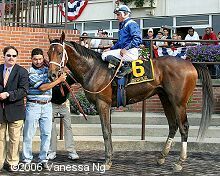 Trainer Nick Zito had 2 horses in the race, but they were the longest shots on the board, as Noble Causeway was 14-1 and Andromeda's Hero 19-1. Noble Causeway battled for the lead with 7-1 shot Wilko most of the way, getting fractions of 24.22, 47.67, 1:11.29, and 1:36.16 over the fast main track. Invasor bobbled at the start, but jockey Fernando Jara quickly got him into contention right away as he settled just off the pacesetters and away from trouble on the outside. At the top of the stretch, both Noble Causeway and Wilko tired from the fast pace and dropped back, as Invasor took over the lead with 3/16 of a mile to go. Invasor drew clear under just one right-handed tap by Jara, to win going away by 4 1/4 lengths over the late-running Wild Desert, completing the 1 1/4 mile trip in a time of 2:01.23. It was just a length back from Wild Desert to another closer, Andromeda's Hero, in third. 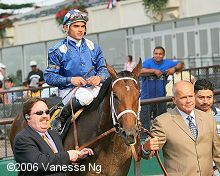 Invasor in the winner's circle with trainer Kiaran McLaughlin on the left. McLaughlin said, "I told Fernando not to give up on him, because the last two times he ran, he kind of dropped back and finished well. He was always sitting there with a handful of horse and said he never asked him until the 1/8 pole. Right now, we're not going to duck anybody, so we have to pick our spots. The nice thing is that he wants to run all day. He was most impressive. He's the real deal. (Jara) is a very good rider, he just needs the horses. We're trying to give him a good jump start." Invasor heads out of the paddock for the post parade. Winning jockey Fernando Jara said, "I asked him a little bit at the 3/8 pole and then he just ran up to the leaders on his own. I was very confident in this horse. Kiaran has done such a great job with him. It's been a great month winning the Belmont and now the Suburban." Second place finisher Wild Desert in the post parade. 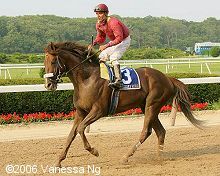 His trainer Richard Dutrow Jr. said, "He ran his race, and I have to be satisfied with the way he ran. I'm not going to make any excuses for him; there's no need to. He just got out-run and beaten by a better horse today. There's nothing to be ashamed in that. As for what's next, I really don't know what I'm going to do with him." Jockey Edgar Prado added "He tried hard. The winner had a perfect trip and I was just following him. He finished strong." Third place finisher Andromeda's Hero returns after the race. 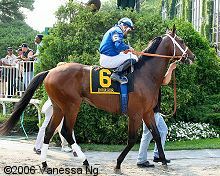 His trainer Nick Zito said, "He is just a good horse that always keeps trying. The trick with him now is to see how races come up and to put him in the right spot. He is doing so well now, and his confidence level is high. You don't want to break that now. We'll look at races like the Whitney and the Woodward at Saratoga"